When the First World War broke out, Newfoundland was a self-governing Dominion of the British Empire and not part of Canada at all. Although Newfoundland and Canada were intrinsically linked by their geographical positions, Newfoundland did not become part of Canada until 1949. 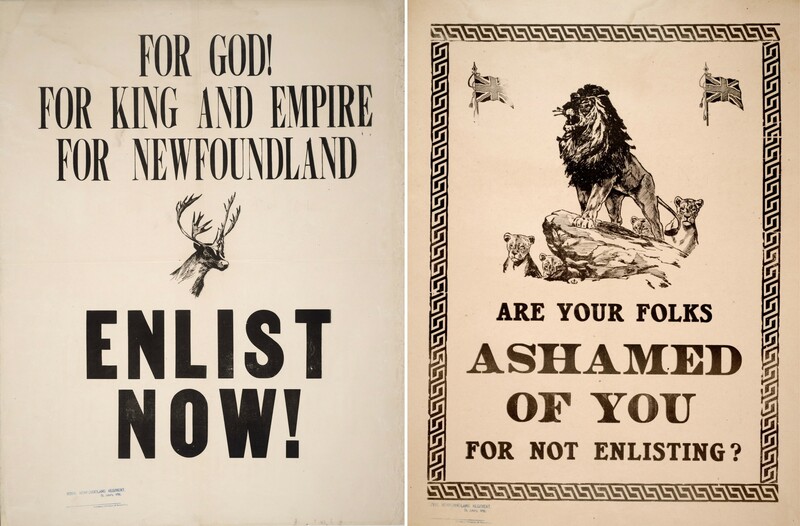 First World War recruitment posters for the Royal Newfoundland Regiment, St. John’s. Poster images: Courtesy of Toronto Public Library. “Newfoundland sent sixty-five hundred soldiers and a couple of thousand sailors into Armageddon. Twenty per cent of the soldiers were killed –which tells much about the sort of fighting into which they gravitated.” Thus, the Newfoundlanders had as much right to mourn as any other dominion of the Empire. “The Newfoundland war expense was about sixteen million dollars, exclusive of what it cost the Imperial government for services which the colony could not well perform. For instance, Newfoundland found a hundred thousand dollars towards hospital service; but did not have its own hospital as Ontario did. Sir Patrick McGrath. 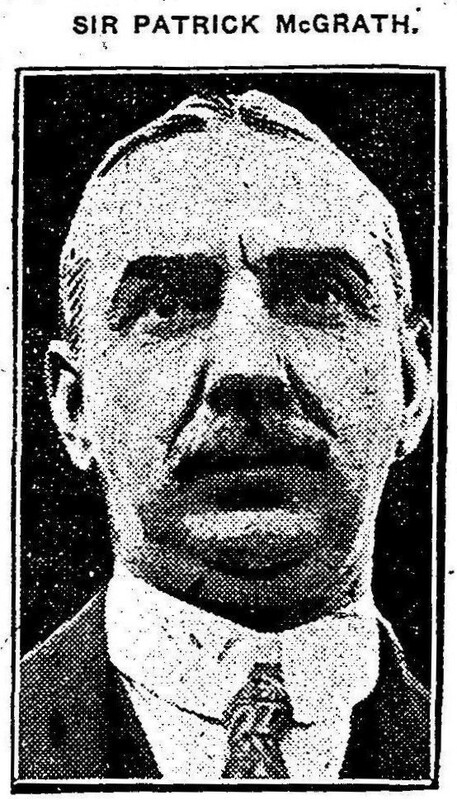 Toronto Daily Star, 15 August 1922. At the time of Madame Anna Guérin’s Poppy campaign elsewhere, there was a Great War Veterans Association in Newfoundland – as well as the G.W.V.A. in Canada. Originally, this Newfoundland G.W.V.A. had been the ‘Soldiers and Rejected Volunteers Association – which had been formed in St John’s NF on 11 April 1918. The S.R.V.A. re-organised itself in August 1918, along the same lines as the G.W.V.A. in Canada. Thus, perhaps, the idea for accepting the poppy emblem came from the Canadian G.W.V.A.? However, Newfoundland’s strongest ties were with New England because of the strong migration of Newfoundlanders into the ‘Boston States’. The Newfoundland G.W.V.A. 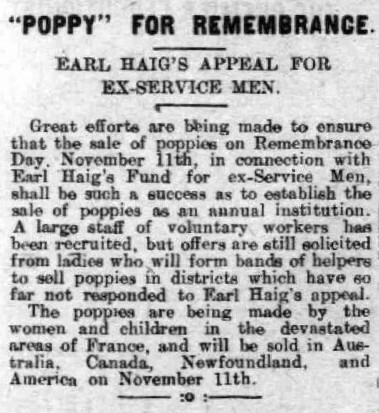 had offices in Boston and New York so, perhaps, it was the USA that played a part in the poppy adoption in Newfoundland? Perhaps American Legion National Commander Frederick W. Galbraith Jr. wrote to the Newfoundland veterans – he had, after all, written a letter of introduction for Madame Anna Guérin to give to the Canadian veterans. Alternatively, it may have been Newfoundlanders who were entirely responsible for bringing the poppy to Newfoundland – after learning that the USA and Canada had adopted it. Ex-Army officer Gerald J. Whitty MC has been linked to running the poppy campaign in Newfoundland. Gerald J. Whitty was the Newfoundland G.W.V.A.’s Secretary Treasurer. He later became the Dominion Secretary and edited the ‘Veteran Magazine’. One of Gerald Whitty’s closest friends was Lt. Col. (Padre) Thomas Nangle, who had been in charge of Newfoundland burials in France in 1919/20 and who contributed much to the commemoration of Newfoundlanders. Did one of these men bring the “Poppy Day” to Newfoundland – did one of them know Anna Guérin? It was learnt later that one Mrs. W.B. Fraser, Vice-Chairman of the Newfoundland G.W.V.A. Ladies Auxiliary, was in charge of the organisational details – she and “willing assistants” (including their friends) conducted the poppy sales. As always, women were the backbone of the poppy campaign. With not much else to go on, with regard to Newfoundland and the Poppy, most of the newspaper articles will be transcribed in full. By 21 October 1921, some 12,000 poppies had already been ordered by the Newfoundland Great War Veterans Association. On 25 October, the St. John’s Evening Telegram reported “Some 12,000 have been ordered and some are now in transit from London.”: probably en route via rail, from London to Liverpool. The cargo of poppies had, presumably, come into the Port of London from France. Perhaps the poppies had travelled up the River Seine to the port of Le Havre, for travelling across the English Channel? “As each successive anniversary of Armistice Day has passed, the sentiment has been expressed among the people of the Allied nations that there should be some tangible evidence of the reverence in their hearts for the heroic dead who made peace possible. The children of the devastated areas of France gave the nucleus of this idea, which is rapidly gaining recognition, when they gathered the red poppies which grow with profusion in Flanders and Northern France, and decorated the graves of the fallen heroes near their homes. The suggestion from the childish hands was seized upon by the French Children’s League, which has been endeavouring to formulate plans in order to provide for the thousands of orphan children of the war area at work making silk replicas of the poppy, with the idea in mind that they could be sold and the proceeds devoted to this pressing need. “The Flanders Poppy for Armistice Day. As each successive anniversary of Armistice Day has passed, the sentiment has been expressed among the people of the Allied nations that there should be some tangible evidence of the reverence in their hearts for the heroic dead who made peace possible. The children of the devastated areas of France gave the nucleus of this idea, which is rapidly gaining recognition, when they gathered the red poppies which grow with profusion in Flanders and Northern France, and decorated the graves of the fallen heroes near their homes. The suggestion from the childish hands was seized upon by the French Children’s League, which has been endeavouring to formulate plans in order to provide for the thousands of orphan children of the war area at work making silk replicas of the poppy, with the idea in mind that they could be sold and the proceeds devoted to this pressing need. (1) The inauguration of the custom of wearing a poppy as a memorial flower on Armistice Day, and thus cherish in perpetuity the memory of the Sacred Dead. (2) As a means of assisting the National War Memorial Committee and the G.W.V.A. The receipts to be equally divided. (3) Extending much needed assistance to the orphan children of France by purchasing at a reasonable price the product of their handiwork. The French-made silk poppies did indeed arrive in St. John’s NF on the ship ‘SS Sachem’. Reportedly, it had taken 7 days to travel from Liverpool, England. It carried 15 passengers, an infant and 700 tons of cargo – which would have included the poppies. After St. John’s, SS Sachem’s destination would have been Boston, Massachusetts via Halifax in Nova Scotia. The arrival of the poppies would appear to have been a ‘close call’. A report in the Evening Telegram on 12 November, not connected with the poppies at all, announced that the ‘SS Sachem’ had “arrived in port yesterday afternoon” … this would have meant the afternoon of the 11th, so may not be correct. Poppies must have arrived early enough in the morning, in order for them to be with the ladies for the distribution that is described as follows. Additionally, in the same newspaper, an irate reporter vented his frustration when writing this: “Shameful Apathy. NON-OBSERVANCE OF SILENCE BY MANY. The shameful apathy shown by so many people in town this morning after the signal for the two minutes silence had been given, must have aroused the indignation of the few who realizing what their brief, quiet period commemorated, honoured it by stopping in their various occupations and concentrating their thoughts on the gallant dead who had gone, never to return. For a brief two minutes it was hoped that every single person in the town would have sufficient respect for the solemnity of the occasion and cease the work on which each was engaged. Some few did – but on the street traffic rolled along as before, motor cars kept on going, long carts did likewise, people went on as if nothing untoward were happening; everywhere apathy or ignorance of what was being commemorated was apparent. There was no excuse for not having heard the signal as the chimes in various city churches gave warning of its approach. There should be very little excuse for a profession of ignorance of the ceremony. What then was the reason for the indecent neglect of the commemoration? Surely, after all the talk we have heard of slack times, people are not going to say that they were too busy to stop for two minutes! Whatever the cause, however, those who refused to keep silence for the short two minutes, who refused to show respect on an occasion of unwonted solemnity, have reason to be as thoroughly ashamed of themselves as those who did show the necessary respect are ashamed of them.” Of course, Newfoundland would not be alone in incidences such as this. Poppies brought in $1,000. This amount was divided between a ‘War Memorial Unlimited’ fund (for a war memorial in St. John’s NF) and the G.W.V.A. With no other participant mentioned with regard to sharing the profit, it appears that Madame Guérin’s League would have benefited only by the sale of the poppies to Newfoundland. 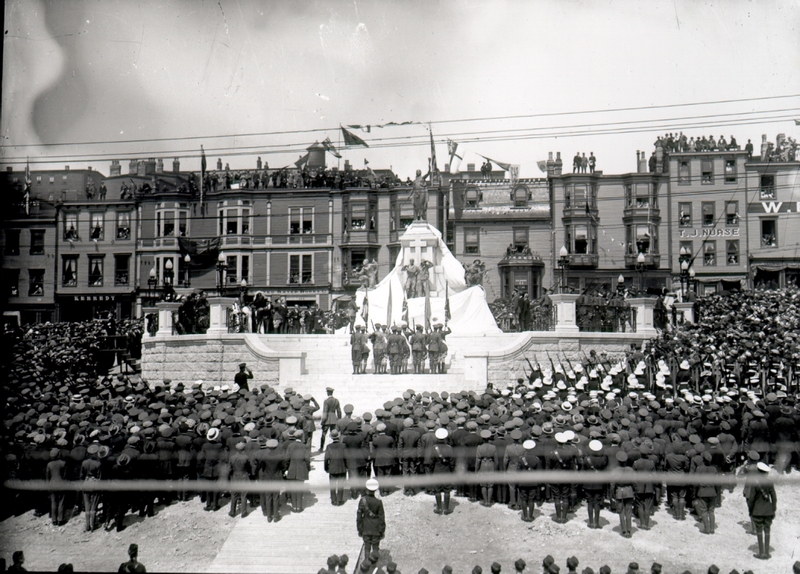 Unveiling the National War Memorial, St. John’s, Newfoundland : 01 July 1924. Courtesy/© of Provincial Archives of Newfoundland And Labrador E-56-18. Newfoundland holds another flower dear its heart – the Forget-me-not. It is worn in the province (and wherever Newfoundlanders find themselves) on the 01 July Memorial Day – in remembrance of their men lost at Beaumont Hamel on 01 July 1916, during the Battle of the Somme in France. The commemoration day has been observed every year since then. 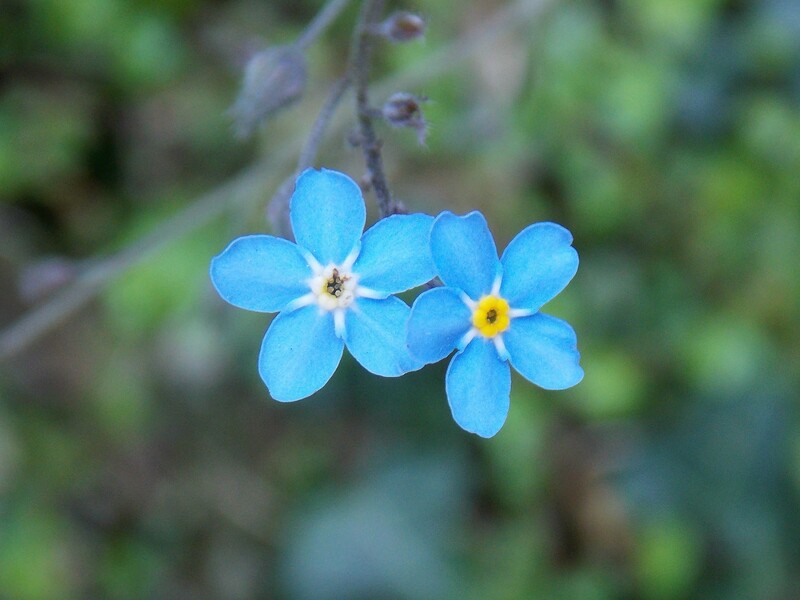 The Forget-me-not was first worn as a flower of remembrance on 01 July 1924. On this day, during his visit to Newfoundland, Field Marshall Earl Haig unveiled Newfoundland’s National War Memorial. Recently, a Newfoundlander explained that the Forget-me-not “fell out of fashion” for a time – from the 1960’s to around 2005. During the 1969 Provincial Command Convention, it had been decided to wind down the Forget-me-not flower fundraising campaign because interest was – revenue was – to solely focus on the Poppy Campaign instead. However the First World War Centenary events spurred a revival in the wearing of the Forget-me-not as the remembrance flower emblem for 01 July commemorations. 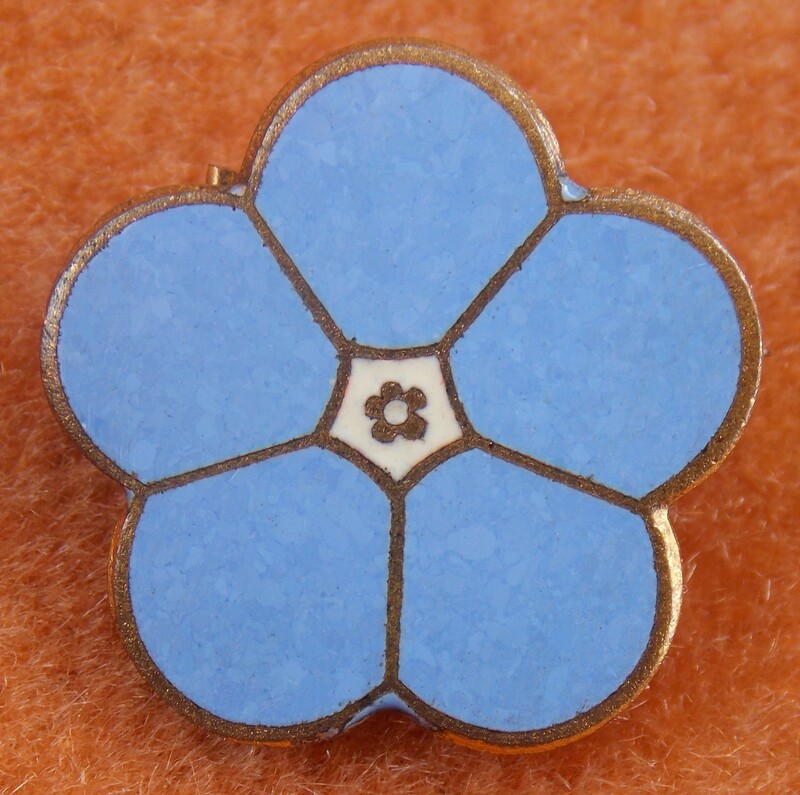 The wearing of the Forget-me not flower was given official authorisation by the Rituals and Awards Committee of the Newfoundland and Labrador Provincial Command of the Royal Canadian Legion in 2015. This came ahead of the centenary, in 2016, of the Royal Newfoundland Regiment’s losses at Beaumont-Hamel. It is authorised to be worn on the left lapel. Newfoundland Forget-me-nots, lovingly made by Florence Morgan-Thom and Barry Thom. Courtesy/© of Florence Morgan-Thom. 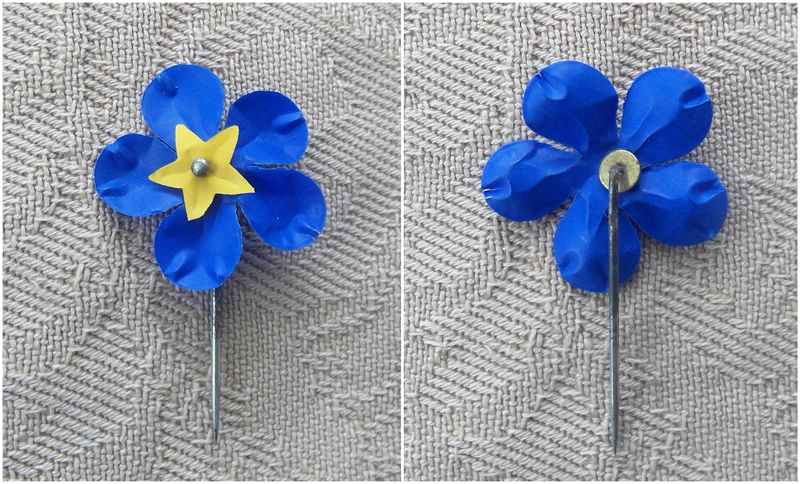 The poignant and astonishing story behind the making of the Newfoundland Forget-me-not lapel pins, shown above, is shared here. In essence, there is a personal First World War story and a passion for remembrance behind their manufacture in Port de Grave, Newfoundland. That story began when one 17 year old Newfoundlander, Eric Francis Taylor, went off to serve in the First World War … never to return home. Eric was serving with the Royal Naval Reserves, when he contracted meningitis and died on 14 March 1915. He was buried in Glasgow, Scotland. As niece Florence Morgan-Thom stood before his headstone, with her husband Barry Thom, it was a very emotional experience – to visit the grave of the uncle she never knew. She had travelled across the Atlantic, to honour a young lad from a family that had been in Newfoundland for 300 years. Having an aptitude for flower arranging, Florence began her remembrance handicraft by making wreaths for her local Bay Roberts Royal Canadian Legion. 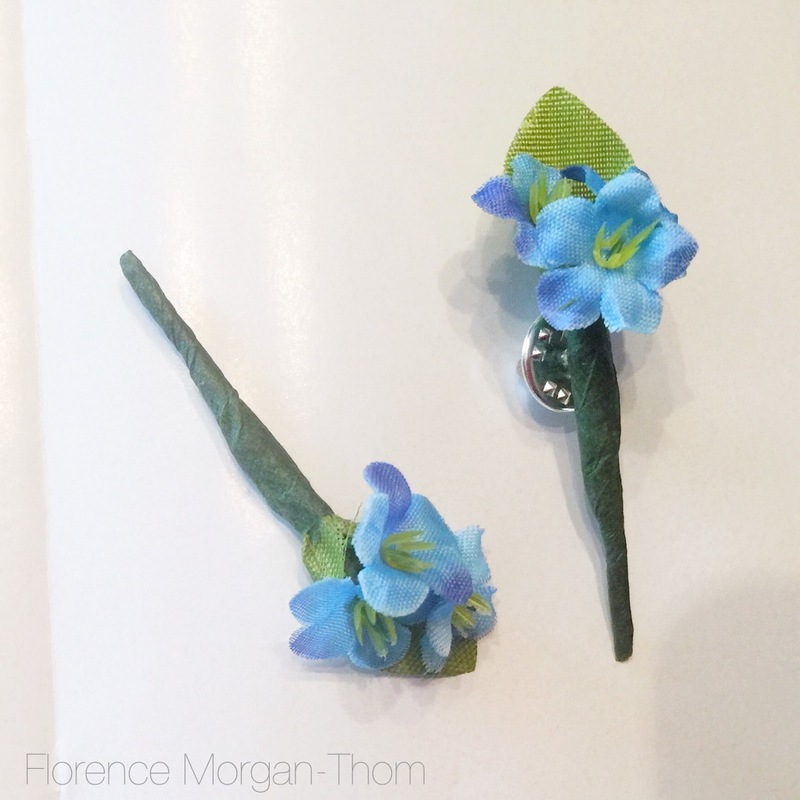 Whilst enjoying her retirement, Florence was asked to create a few Forget-me-not pins in 2011 … and has not looked back since. At the time of writing (July 2016), Florence (with Barry’s help) has made approx. 102,000 Remembrance Forget-me-not pins – what an amazing achievement by two retirees! Now, the Newfoundland and Labrador government; more Legion posts; and other groups are sending in their orders … sometimes for as many as 2,000 at a time. Florence can make 200 pins a day – it is a non-profitable venture for her … it is a full-time labour of love. When the province of Newfoundland and Labrador became part of Canada, the significance of the Forget-me-not flower to the province suffered – but, today, Florence and Barry are proud of playing their part in resurrecting that tradition. Today, the Forget-me-not can sit side-by-side the poppy on equal terms in Newfoundland. British Forget-Me-Nots. May 2018. Courtesy/© of Heather Anne Johnson. 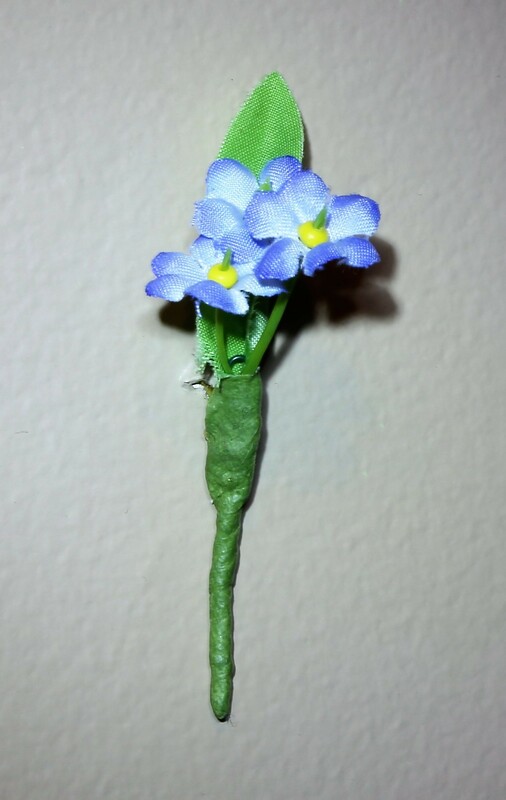 A mysterious vintage ‘Forget-Me-Not’ (Myosotis) pin. It is made from a delicate synthetic material and was purchased from France. However, its country of origin has not been established. It could be a German Remembrance pin, sold for charity(?). Courtesy © Heather Anne Johnson. A beautiful vintage British Masonic Freemason enamel Forget-me-not lapel pin badge. Courtesy © Heather Anne Johnson.